It’s a real “dog day afternoon”! The Long Island Kennel Club welcomes families and their fur children to the Long Island Dog Festival on Sunday, May 20 from 9 a.m. – 4 p.m. at the beautiful Planting Fields Arboretum in Oyster Bay. The festival is part of the annual Long Island spring dog shows on Friday and Saturday (held by the Ladies Kennel Association) and Sunday’s Long Island Kennel Club show. Sunday’s Long Island Dog Festival celebrates all things canine, from impeccable show dogs and agility training to doggie diving and talent shows. Fun-filled events and attractions make this festival a treat for anyone who loves dogs – that is to say, everyone! The day’s activities culminate with the Conformation Show on Sunday. Hundreds of superbly presented dogs – coiffed collies, pedicured poodles, dandified Dandie Dinmonts, and other breeds recognized by the American Kennel Club –vie for bragging rights as they contend for Best in Show. All are invited to this parade of pups and cheer on the winner of the coveted ribbon. Sunday is also Costume Day at the Long Island Dog Festival. This year’s theme: Long Island Nautical. Prizes will be awarded for the best adult costumes (male and female), children’s costumes (boy and girl), and pet costume. Whether or not your dog has fleas, the Sunday Flea Market will offer a huge assortment of new and vintage items for all tastes and budgets. That includes jewelry, art, housewares, fashions, and gifts of all stripes (spots?) for any dog lover. AKC’s My Dog Can Do That! : A professional instructor will help your dog navigate tunnels and jumps, just like those high-powered agility dogs on television. Dog Trick Competition: Can your hound give a high five? Can your terrier tap dance? Four-legged friends are invited to strut their stuff in the “My Dog Can Do That” competition. Dock Diving: It’s the latest water sport for dogs! A professional will be on hand to teach your pooch how to make a splash. Dog Shows: From toys and terriers to herders and hounds, watch these professional pooches strut their stuff. Hosted by the Ladies Kennel Association on Friday and Saturday and the Long Island Kennel Club on Sunday. Ask a Breeder: This is your chance to meet local purebred breeders and ask them anything you’ve always wanted to know about your specific breed. Canine crafts: A special coloring area lets even the youngest dog lovers be part of the action – and a professional face painter will transform little ones into playful pups. Chow: An array of food and drinks will be available for purchase – including hot dogs, of course! Vendors: Take some pooch-centric goodies back to your dog house. Photo Caption: AKC My Dog Can Do That! 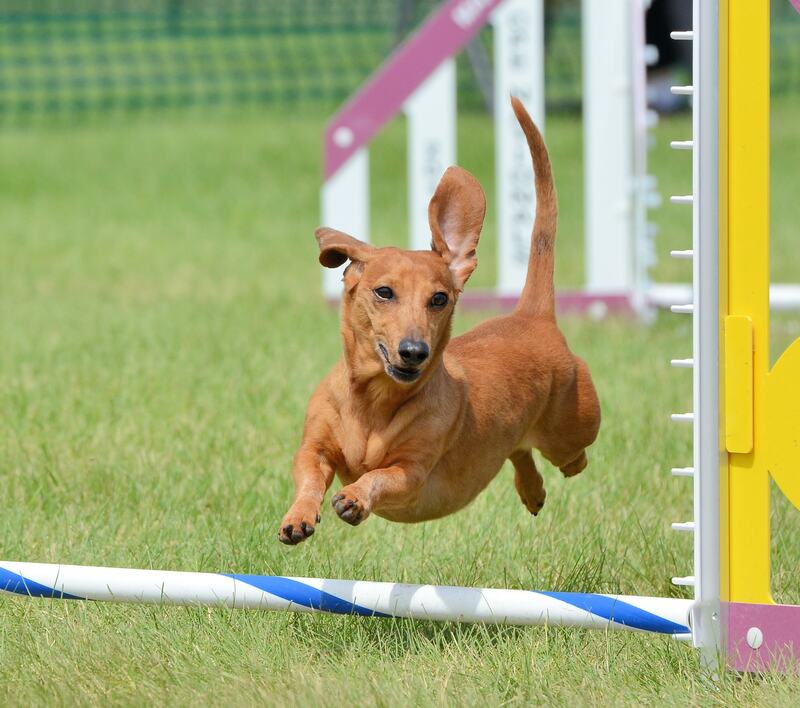 shows dogs the ropes in the obstacle-course sport of agility. For general information about the show, contact 516-378-9081 or 631-928-4312, or visit www.longislanddogshows.com. For vendor information, call 516-378-9081.